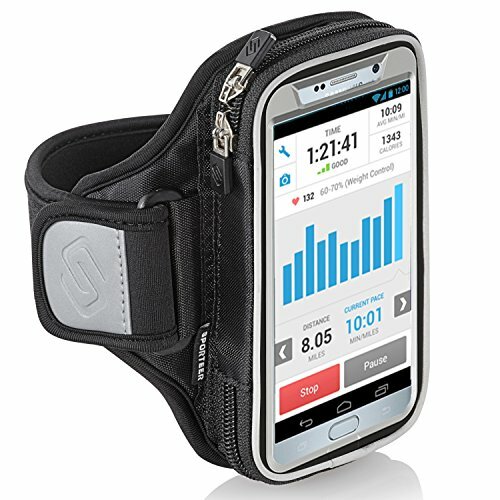 Designed and thoroughly tested in the USA by athletes, for athletes, the Sporteer Entropy E8 Armband is engineered to fit large and heavy phones with cases including Otterbox, Lifeproof and battery cases. THE ENTROPY E8 ARMBAND FITS ALL PHONES AND CASES UP TO 165 x 90 x 16 mm INCLUDING iPhone 8 Plus, iPhone X, iPhone 7S Plus, iPhone 6S Plus, iPhone 7/6S with Otterbox Defender case, Galaxy Note 8, Note 5, Galaxy S9, Galaxy S9+, Galaxy S8 Plus, Galaxy S8, A9, LG V30, LG V20, Nexus 6P, Nexus 6, Moto Z2 Play, Xperia XZ2, XZ Premium, Moto Z2 Force, Google Pixel 2 XL, Pixel XL, and MANY more phones and cases. The soft, moisture-wicking memory foam backing ensures this armband stays in place while running and protects your phone and other items from sweat and moisture and features modular/removable straps to ensure a perfect, comfortable and secure fit directly on skin or over clothing. Do you want to wear your armband directly on your arm in warm weather and over clothing in cold weather? Now there is no need to buy two armbands - just pick up a different strap size at a fraction of the cost and have a perfect fit no matter what your wear. TWO STRAP SIZES INCLUDED: S/M Bundle: Includes one Small Strap and One Medium Strap M/L Bundle: Includes one Medium Strap and One Large Strap Strap Size Arm Size (upper arm circumference) Small 8 - 11 inches (20 - 28 cm) Medium 10 - 14 inches (25 - 36 cm) Large 13 - 18 inches (33 - 46 cm). The Entropy E8 is a premium armband using the most comfortable and durable materials available and Sporteer guarantees the quality of all products and offers a full 1-Year warranty. SPORTEER IS BASED IN SCOTTSDALE, AZ, USA AND ALL CUSTOMER SERVICE AND DESIGN FUNCTIONS ARE CONDUCTED IN THE USA. IF YOU HAVE ANY QUESTIONS ABOUT COMPATIBILITY WITH YOUR PHONE, PLEASE CONTACT SPORTEER CUSTOMER SERVICE FOR ASSISTANCE. UNIVERSAL SPORT ARMBAND DESIGNED FOR LARGE PHONES AND CASES: Armband is designed with a large zippered pocket to fit ALL phones and cases up to 165 x 90 x 16 mm including iPhone 8 Plus, iPhone X, iPhone 7 Plus, 6S Plus, Galaxy Note 8, Galaxy S9, Galaxy S9+, Galaxy S8 Plus, Galaxy S8, S7, S7 Edge, Google Pixel XL, Moto X4, Moto G5S Plus, LG V30, V20, LG G6, Nexus 6P, Sony Xperia XZ2, iPhone 7, iPhone 6S w/ Otterbox Defender, and MANY more. MODULAR DESIGN WITH REMOVABLE & INTERCHANGEABLE STRAPS: Armband straps can be easily removed and replaced with different sizes and styles to guarantee a perfect and comfortable fit on a bare arm or over clothing - two running armband strap sizes included - see description for strap size details. SWEAT RESISTANT FOAM BACKING AND MOISTURE BARRIER: Soft memory foam backing ensures this exercise armband fits comfortably and securely, even while carrying large, heavy phones and provides exceptional sweat resistance. An internal liner provides additional sweat resistance. ESTABLISHED USA COMPANY AND BRAND: Sporteer is an established and respected company based in the USA and our products can be found at premium retailers around the world. Our products are designed with performance in mind - not the lowest price. Our customer service is USA-based and our 1-Year warranty is backed up with a 100% performance guarantee. If you have any questions about this product by Sporteer, contact us by completing and submitting the form below. If you are looking for a specif part number, please include it with your message.